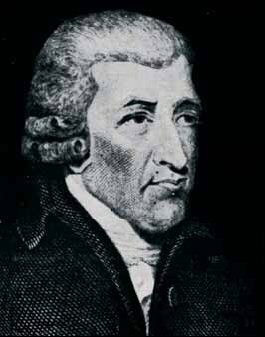 July 20th 1753, died, at his house at Norton, Jeremiah Moore, esq., aged 57. He was the last of his family; and had, in the former part of his life, suffered extreme hardships, through the cruelty of his older brother; by whose means he was carried into Turkish slavery; and at the time of his brother’s death, was a common seaman in the navy, having been pressed in the Mediterranean, after he had made his escape from the Turks. When he came to his estate, he converted it into money, and settled in the north, exercising acts of goodness to all his poor neighbours, to whom he left largely. Having no relations, he bequeathed to six gentlemen, who were kind to him in his adversity, £1500 a-piece; and to his housekeeper, Mrs Ann Kendal, his executrix and residuary legatee, £3000 in trust for her son. All the legatees were enjoined to receive their legacies at his house in Norton, over a large bowl of punch, on the first of March next after his death; and they were required yearly to commemorate that day as long as they lived, it being the day he escaped from slavery. The great William Thomson “Will” Hay was a famed comic screen actor of 1930s and 40s Britain. As a child, he lived in several locations throughout England as his father sought work, but was actually born in Stockton-on-Tees to parents William and Elizabeth in December 1888. Will began his adult life as an engineer in Salford, but decided to become an actor in his early 20s, spending many years as a music hall performer – including some time in Fred Karno’s famous comedy troupe. After a long and successful stage career, he broke into film in his mid-40s and spent a short but highly successful few years in the business (1934-1943), before moving (very briefly) into radio. His film portrayals saw him play bumbling authority-figure characters – among them lead roles in Boys Will be Boys, Oh, Mr Porter!, The Ghost of St.Michael’s (above), and My Learned Friend. He wrote much of his own material, and was also, interestingly, a highly-respected amateur astronomer (and a Fellow of the Royal Astronomical Society, no less). Furthermore, he was one of Britain’s first private pilots (he gave lessons to Amy Johnson) and spoke several languages proficiently. He was married – and fathered three children – before separating from his wife, Gladys. Sadly, he spent the last two years of his life disabled following a stroke in 1947. 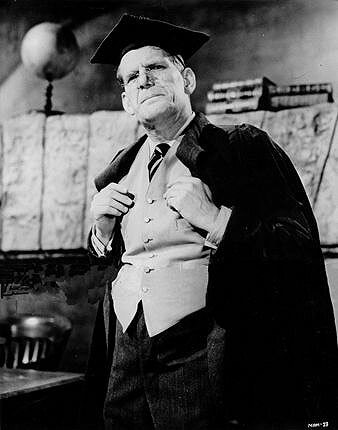 Will Hay died in 1949, aged just 60, and was buried in London. Henceforth I will only post to this blog ONCE per week - usually a Tuesday. Any guest posts by other folk will appear on Fridays (though no one has yet submitted any articles). If you wish to contribute - or for further details in general about this change in policy - see here. One of Stockton-on-Tees’ greatest claims to fame is that it was the home of the man who invented the friction match, one John Walker. The chap in question was born and died in the town, spent most of his days there and, crucially, made his invention in his little chemist shop on the town’s High Street. Matches weren’t a new idea. The Chinese had a version of them when the British were still in the Dark Ages, and many famous names had fiddled about with the concept in Europe way before Walker was born (including Robert Boyle). However, the self-igniting friction match was something new – and the North-East is most certainly the place where it first saw light of day (as it were). Walker was born in 1781, and was supposed to have been a surgeon. Not liking the sight of blood, he instead switched his studies to chemistry, and eventually opened up his own place in his home town. He became obsessed with the idea of obtaining fire easily and began experimenting with various concoctions – until he hit upon a successful combination of chemicals and equipment in late 1826. There are various versions of the momentous event itself, but it seems that Walker noticed that a mixture of chemicals he had been working with had hardened on a mixing-stick – and when he tried to rub them off on the hearth, the thing ignited in his hand. And thus the friction match was born. He didn’t seem to think much of the invention. From April 1827, he sold a few dozen packets of them (complete with a sandpaper sheath through which to draw the match-stick, and called ‘Congreves’ in honour of another inventor, one Sir William Congreve), but never got round to patenting the idea. Inevitably, others copied or came up with near identical ideas in time, and the fortune-making ended up elsewhere (notably Samuel Jones’ ‘Lucifers’ from 1829). However, John Walker seems to have done sufficiently well out of his creation to enjoy a reasonably comfortable life up to his death in 1859, aged 78. He is buried in nearby Norton. Some time ago, I was inquiring when the old ‘stocks’ were removed from Stockton, but no one knew anything about them. The punishment of setting people in the stocks was general in former times, being a frequent order by the justices in Quarter Sessions. 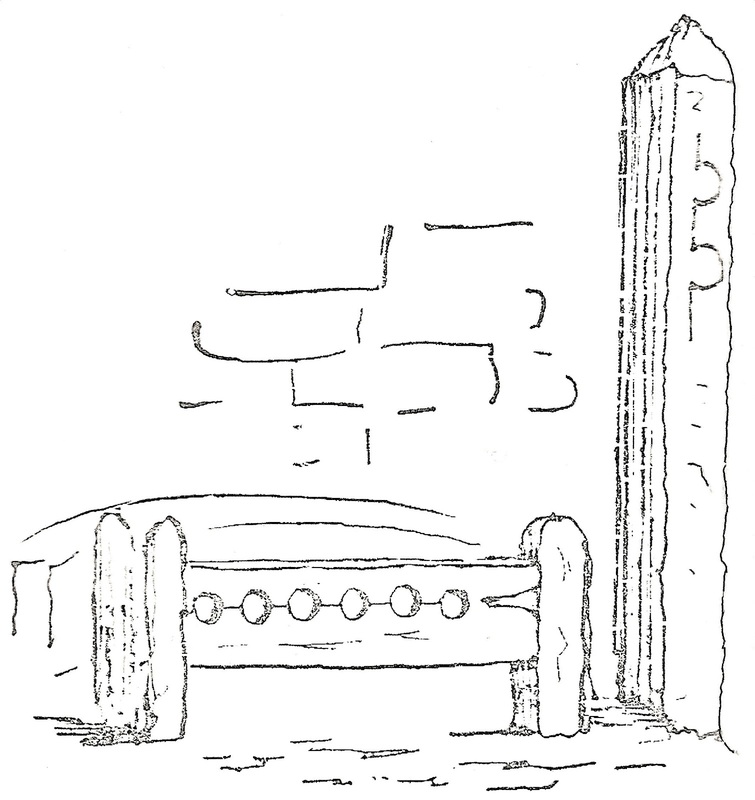 We are told by the antiquaries that stocks were used in Anglo-Saxon times, and anyone who owns a copy of the ‘Records of the North Riding’ will learn their use at a very early period, with particulars, also, of the whipping-post, a punishment to which women, as well as men, were condemned. 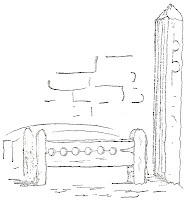 At a Quarter Sessions in 1651, the inhabitants of a parish near Easingwold were fined for not having a pair of stocks in their constablewick. I remember having seen men in those at Stockton, but do not remember seeing anyone whipped. The stocks and whipping-post were at the south-west corner of the Town Hall. I have made a drawing of both, which I remember well. The market of that day was very thinly attended; the butter-sellers were all on the north side of the Cross, and the corn market at the north side of the shambles. There were a few stalls for the sale of different kinds of clothing and very small hooks; also carts with vegetables, &c. On the west side were all kinds of odds and ends. On one occasion a man got on to one of these stalls and called a public auction for the sale of his wife. The woman was sold for 2s 6d. The affair caused a great noise in the town. The rage for improvement has cleared away another mark of an old pastime in Stockton. That was a flat stone about three feet square with a pin in the centre, to which in former days was attached a ring with a chain for holding a bull to be baited. This was near a public pump, and on the west side of what was called the Coal Hill, where carts with coals, for the supply of the town, usually stood for sale on the Wednesday and Saturdays. From this week onwards I will only post to this blog ONCE per week - usually a Tuesday. Any guest posts by other folk will appear on Fridays (though no one has yet submitted any articles). If you wish to contribute - or for further details in general about this change in policy - see here. The village of Sadberge, a little to the east of Darlington, has one of those ancient-sounding place-names that you just know has a long and interesting history. And it has, though a good deal of it has always lain tantalisingly out of the reach of a succession of local historians. What is known for sure is that a Roman road, Rykenield Way or Street, ran directly through the place, north-south, and that because of the settlement’s elevation, they probably maintained a signal station of sorts on the spot. Perhaps they even built a camp or a fort there, but no one has been able to find definitive evidence. Rumours persist of a later ‘Saxon castle’ in the vicinity of St.Andrew’s Church – perhaps a stronghold of the Dark Age Kingdom of Deira. Next it was the Vikings. And it was they who gave the village its name – Sadberge deriving from ‘Set-berg’, meaning ‘flat-topped hill’. It became, in fact, the focus of their local wapentake (administrative centre), covering large tracts of land to the North of the Tees. Its status stuck for centuries thereafter, and became known as the ‘Earldom of Sadberge’. It was so special, in fact, that it was not initially taken into the domain of the Prince Bishops of Durham in the early days of Norman rule – but was eventually added in 1189. It remained ‘special’, however, and continued to be administered almost as a separate county until deep into the 16th century. Today is the blog's 2nd anniversary!